Insurgent is the second installment to the Divergent Trilogy. Shailene Woodley is the divergent Tris still on the run from the futuristic government. She is accompanied by her boyfriend Four (Theo James), her cowardly brother Caleb (Ansel Elgort) and the troublesome Peter (Miles Teller). She and the others are hiding in another faction that pretty much looked like a bunch of hippies. The government is set on opening a box that only Divergents can. It features all five Faction Simulations. Abnegation, for the selfless; Amity, for the peaceful; Candor, for the honest; Dauntless, for the brave; and Erudite, for the intellectual. 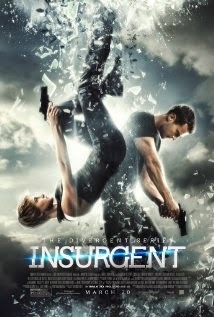 Jeanine (Kate Winslet) tests out some Divergents but all of them die, leaving Tris as the last possibility. Tris is forced to visit Erudite headquarters or lose those close to her. She beats all the simulations and at the end there is a message that I don't want to spoil. In the meantime, Four's supposedly dead mom (Naomi Watts) is building an army to take down the corrupt government. The movie ends with her taking her army to save Tris. The story was good but had a few plot holes that maybe the books filled. The action and visual effects are what dragged me in and the suspense kept me on my feet. Books into movies are slowly taking over the screens and the Divergent series could be one that competes with Hunger Games. Either way, it's a story worth watching.